We were fortunate enough this morning that the rain had stopped by the time we got up. Malcolm took one of our LP tanks over to the farm and feed store and had it filled. After he stopped by and hooked it up, he took the truck over to have the fuel filter changed. The shop had that done pretty quick, so he headed back to the campground, stopping to fill the truck’s fuel tank on the way. While Malcolm was out running his errands, Val prepped the trailer for moving by doing her thing inside. Malcolm cleaned the tops of the slides and unhooked while Val pulled the slides in and finished packing up the inside. We rolled around and dumped all the tanks and were on the road a little after 10:00 am. Before we forget, you can track our current trip by clicking here. The truck ran really great with the new towing tune installed. We think we’ll do fine as we travel in more hilly terrain. Fuel mileage remains the same around 9 mpg or so. 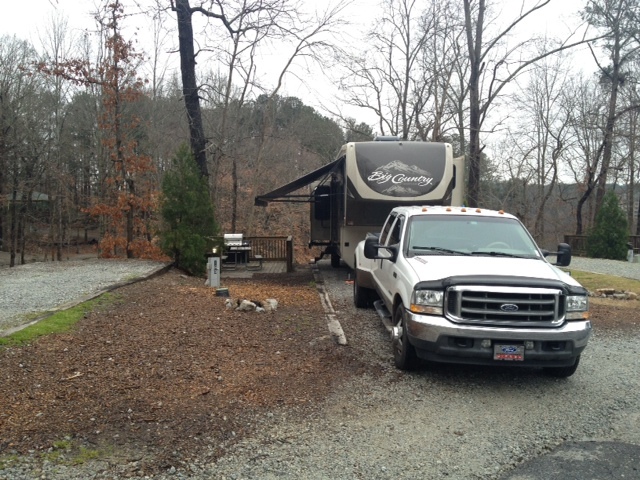 We arrived at Stone Mountain around 4:00 pm and had the trailer all unhooked and opened up pretty quickly. The sites in this section of the park each have their own little deck with a gas grill and picnic table. We took the opportunity to break out our new outdoor mat for this stop. 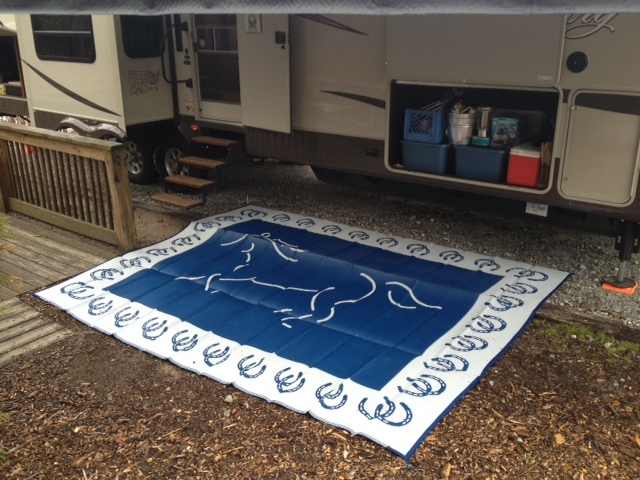 We ordered it from Camping World back when we were in Seattle and it arrived this past week. Since it has been so rainy at home, we didn’t bother unpacking it yet. It should be right at home when we visit Kentucky in late March/early April. Though we had spaghetti on the menu for dinner, we decided to eat out this evening. We went to Stone Mountain Pizza Cafe and had some excellent pretzels for an appetizer. They were sitting in garlic butter. 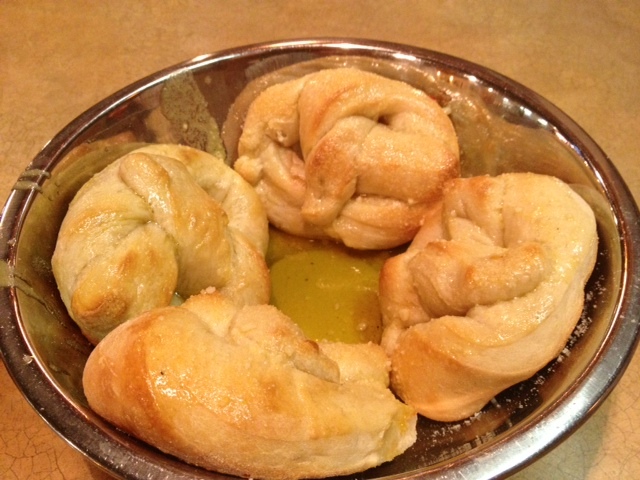 Pizza dough pretzels in garlic butter. 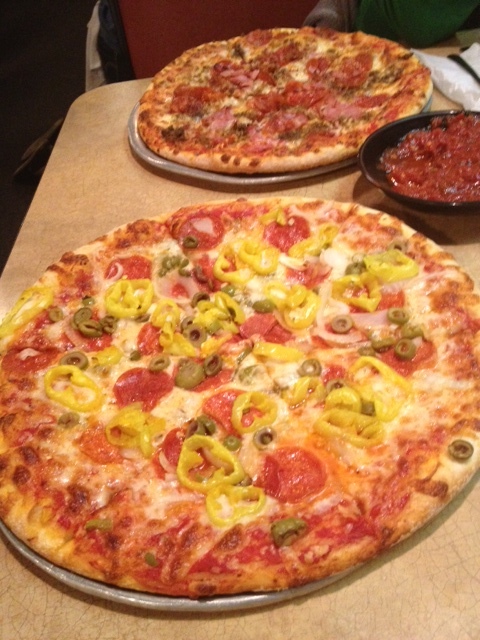 We each got a 12″ pizza with our own toppings. We ended up bringing more than half of it back to the trailer. Tomorrow, some long-time friends of ours that live in the Atlanta area are coming over to visit, see the trailer, talk about RVs and go out to lunch. We think we might do laundry in the morning and a little sight-seeing after lunch. We initially planned to roll out of here on Monday, but we think we’ll stay another day. This entry was posted in Georgia, traveling. Bookmark the permalink. The pretzels look really good, so does the pizza!